The South Korean ferry Sewol sank on April 16, 2014, on its way to Jeju Island with 476 passengers and crew onboard. After a tragic failure of rescue operation, 295 people died and 9 are still missing. As of September 2016, the ship is still under water, as the salvage operation that started last year is yet to be completed. The Special Investigation Commission on 4/16 Sewol Ferry Disaster is struggling to accomplish its mission, while the Korean government wants to shut it down. On July 19, 2014, three months after the sinking, family members of the victims who were still missing watched the ongoing search operation from a boat. Photograph by Lee Sang Im. Teach Sewol started as an educational project to create a website that can provide materials for classroom sessions on the Sewol disaster. 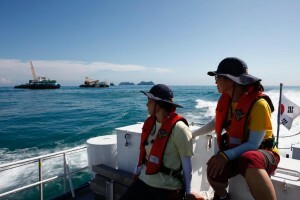 First launched on the first anniversary of the disaster (April 2015), the Teach Sewol website features various kinds of materials that can be freely used by educators and students: several class plans in the form of slides with materials and discussion points; primary documents produced by the government and related agencies; hundreds of photographs generously offered by dozens of photographers; a blog for news updates on Sewol. A group of scholars from multiple disciplines, website developers and designers, and dedicated research assistants worked together to discuss themes and prepare educational materials. The initial editorial board for Teach Sewol includes a current Korean-language editor for Teach311.org, so the two projects share a commitment to teaching disasters within their complex historical, political, cultural, and technoscientific contexts. With its emphasis on teaching, Teach Sewol also participates in a nationwide (and international) movement to “remember” the tragedy and its victims, which is another agenda it shares with Teach311.org.